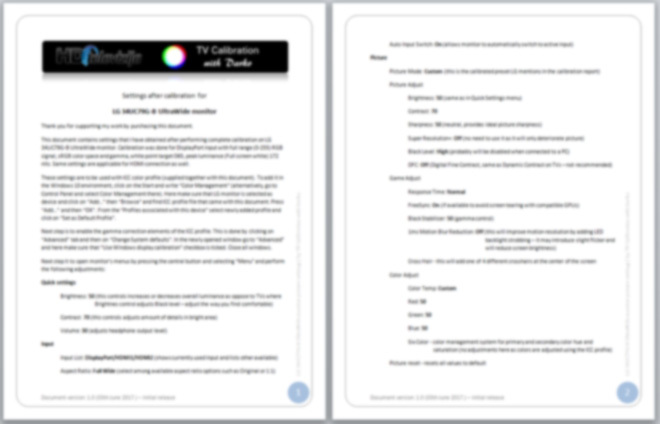 This document contains settings that I have obtained after performing complete calibration on LG 34UC79G-B UltraWide monitor. Calibration was done for DisplayPort input with full range (0-255) RGB signal, sRGB color space and gamma, white point target D65, peak luminance (Full screen white) 172 nits. Same settings are applicable for HDMI connection as well. These settings are to be used with ICC color profile (supplied together with this document). There are 2 ICC profiles attached - uncalibrated and calibrated. Calibrated should be used together with the adjustments as shown in the document.